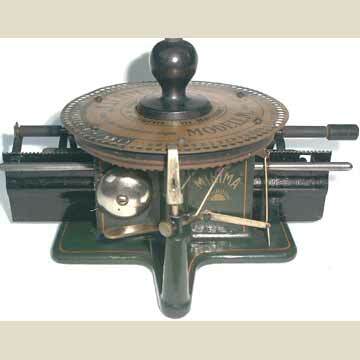 The Liliput was a small circular index machine with rubber type that was fixed to the bottom of the index, much like the Simplex. The Liliput however, was a much more solid machine. The operator would turn the knob in the middle of the circular index until the right character was in place. By pushing the knob, the letter was printed. Inking by roller. Paper was rolled up and put in the paper tray, after which it was fed up through a double platen. There were three models of the Liliput, of which the minima, was the most simple version.